Today we are proud to announce the upcoming release of VMware vRealize Operations 7.5, which will continue to refine the foundational “self-driving operations” vision established in the last two releases. If you’ve been following the development of vRealize Operations over the last few releases, you’ll notice #4 is a new tenet. 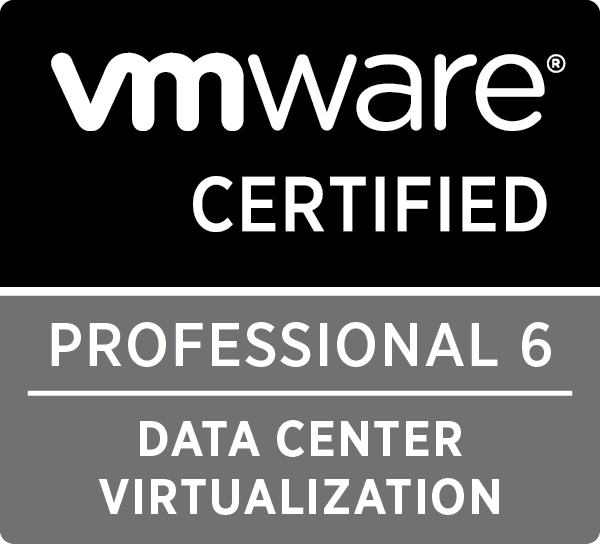 We’ll get into more details later in the post, but for now we are happy to announce integrated compliance as a new, major benefit that will be accessible in vRealize Operations 7.5.
vRealize 6.7 and 7.0 were operations management game changers, and our customer feedback to date has confirmed we’re on to something special. We commissioned a reboot of Forrester’s Total Economic Impact (TEI) Study this year just to quantify exactly how good vRealize Operations 7.0 has been at saving our customers time, money, and sanity – and the results are in! Customers using 7.0 realized over 300% in 3-year ROI, and passed the break-even point on their investment in under 3 months. WOW. We didn’t expect everything to come out in “3’s” so nicely, but it certainly makes for a memorable conclusion! Review the 2016 study here, check out our full breakdown of the 2019 results here, and read on to see how on earth we’ve managed to improve even more on vRealize Operations in 7.5. So What’s Actually New in 7.5? 2019 promises to be a massive year for hyper-converged infrastructure (“HCI”), and vRealize has become the go-to for managing HCI performance, observability, planning, and troubleshooting. 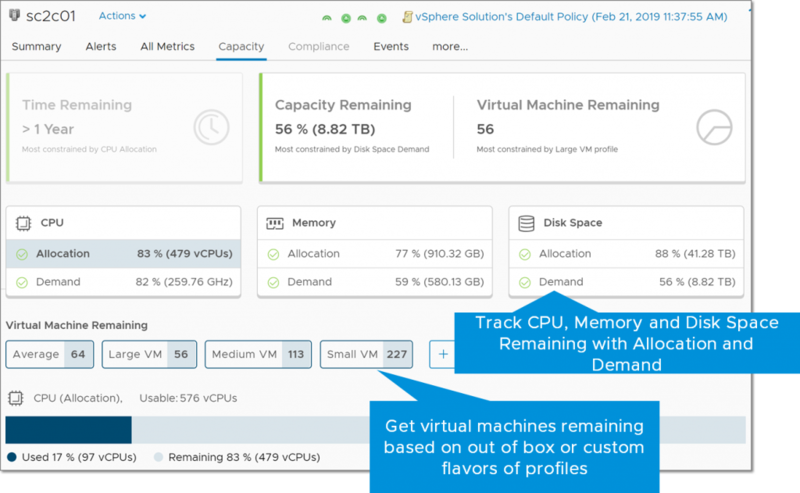 We’re really excited to introduce VMware vSAN-aware performance optimization in vRealize Operations 7.5. 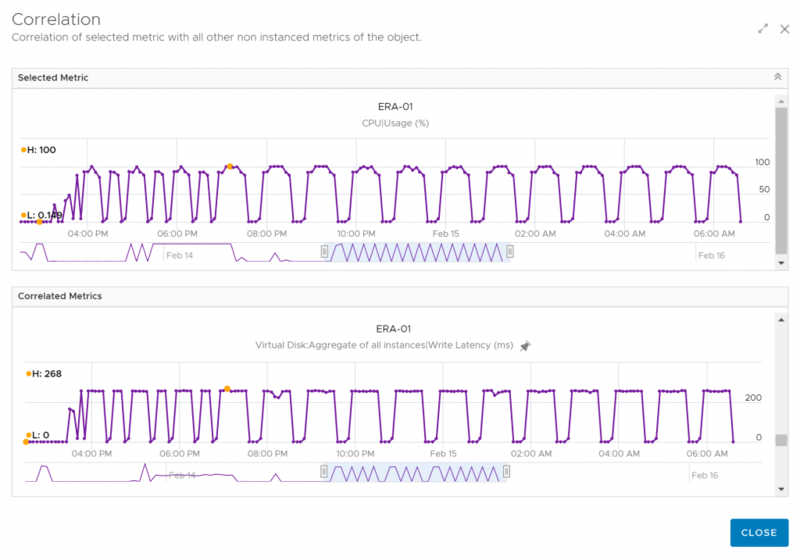 Users will now be able to fully optimize datacenters that contain vSAN clusters, with workload optimization that is resync, slack space, and storage policy aware. As with existing performance optimization capabilities, users will be able to easily teach the system the operational and/or business intent-based policies for their unique environment, then choose to (1) manually conduct workload optimization, (2) schedule optimization for a later date/time, or (3) let vRealize Operations fully automate the optimization process (with full user visibility into what it is doing in the background). …the return of the allocation model! Another incredibly cool development in the realm of HCI management is the ability to identify orphaned (or “zombie”) virtual disks with reclaimable capacity! Just like you’ve been able to view idle VMs with reclaimable capacity, you will now be able to see all orphaned disks with reclaimable disk space and associated cost savings. 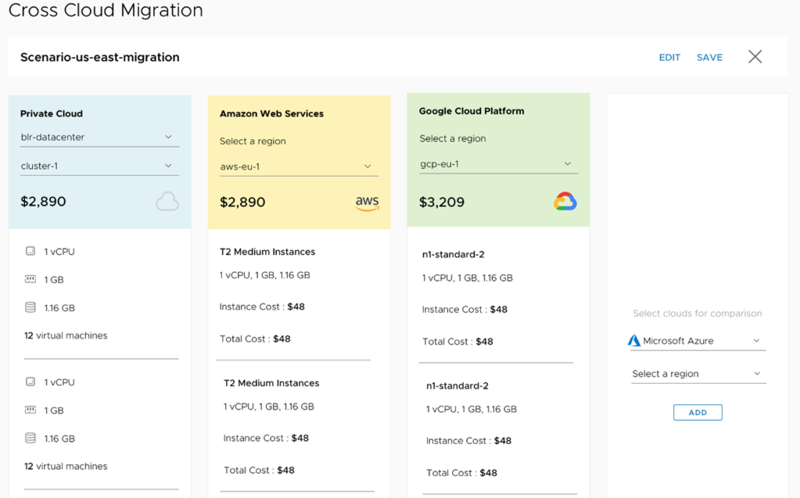 One of the biggest feature enhancements in 7.5 is the variety of “what-if” scenario improvements and enhancements we’ve made, to help you better plan for future infrastructure build-out or cloud migration. Not only will you be able to plan for new workloads and adding physical infrastructure – you’ll also be able to plan full HCI capacity additions, public cloud migrations, and complex projects with multiple variables involved. That’s right – starting in 7.5 you will be able to plan huge projects like application deployment or retirement, hardware refresh, and so on with the new “stackable scenarios” capability. Now we come to the part of the announcement where I wish I hadn’t used my drumroll early, because one of the most significant NEW features that 7.5 will bring into play is… [second drumroll]… native application and OS monitoring! That’s right – vRealize Operations 7.5 will provide full visibility from apps-to-infrastructure. 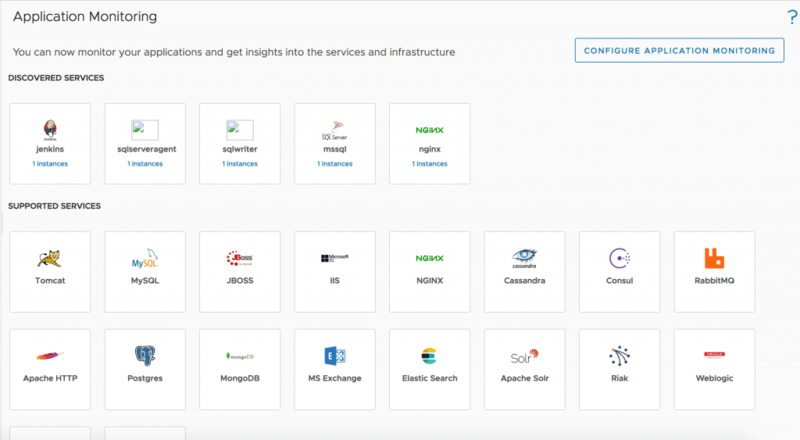 This is a HUGE new set of capabilities that have gone into the product to give complete observability into your entire environment and troubleshoot performance issues even faster and more seamlessly than ever before. 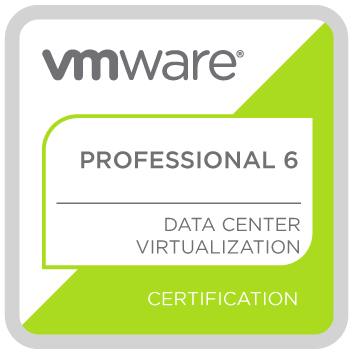 7.5 will automatically discover supported services running in your environment and allow you to choose whether you want vRealize Operations to monitor those applications directly, or just pull those metrics straight into Wavefront by VMware. Both Wavefront and vRealize Operations are now using Telegraf agents for metric collection and reporting, which does mean that Endpoint Operations will not be supported forever – but you’ll still be able to use it with 7.5 if you like. One of the coolest new interfaces in 7.5 is the new object relationship widget, which will give you super quick/intuitive line-of-sight from app to infrastructure. All object relationships are charted here and you will be able to easily click into any of the objects shown to evaluate the health of that particular object. This will allow you to evaluate whether a performance issue is isolated to an application, or whether it’s due to an underlying infrastructure problem – all in a matter of seconds. And don’t worry about maxing out the widget – it can handle up to 10,000 objects at a time. To support this new object topology, 7.5 will also be adding metric correlation capabilities, allowing you to quickly view correlations of a particular metric across multiple objects, or of a wide variety of metrics within a single object (as shown below). The relationship widget and ability to correlate metrics will give you powerful visuals and analytics for quickly honing in on the root cause of an issue. One more popular ask that we were able to incorporate into 7.5 is bi-directional ServiceNow integration, so you will be able to feed powerful information into the workflows you need. No matter what regulatory or IT standards your business needs to operate within, vRealize Operations will be able to enable compliance of your vSphere environment. 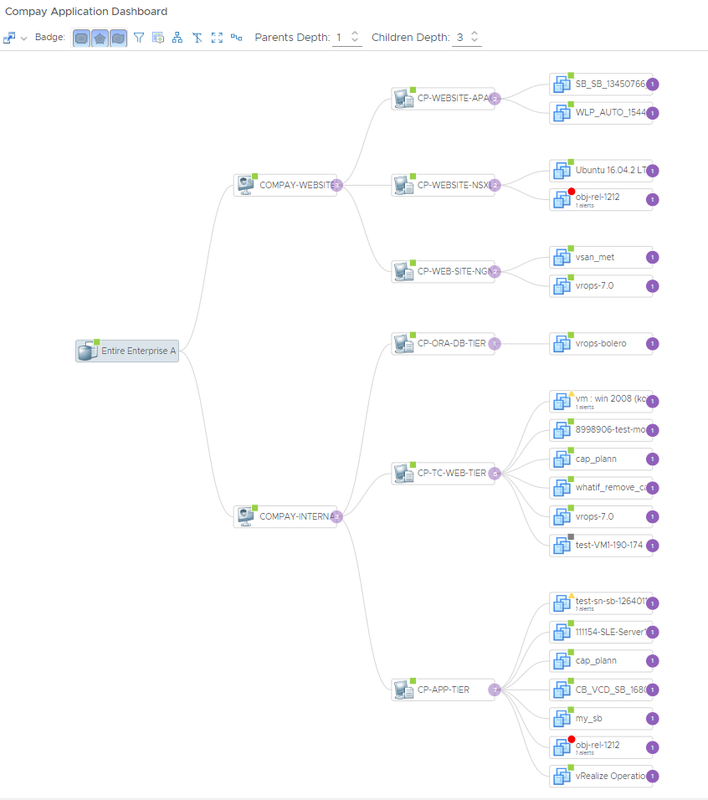 In addition to common compliance templates like PCI, HIPAA, DISA, ISO, CIS, and FISMA, you will be able to create your own custom compliance standards and activate automated configuration management and drift remediation with out-of-the-box workflows and VMware vRealize Orchestrator integration. As you might expect, these compliance workflows are completely integrated with the rest of vRealize’s Self-Driving Operations mandates, meaning configuration changes will be interpreted in light of other performance or capacity requirements. 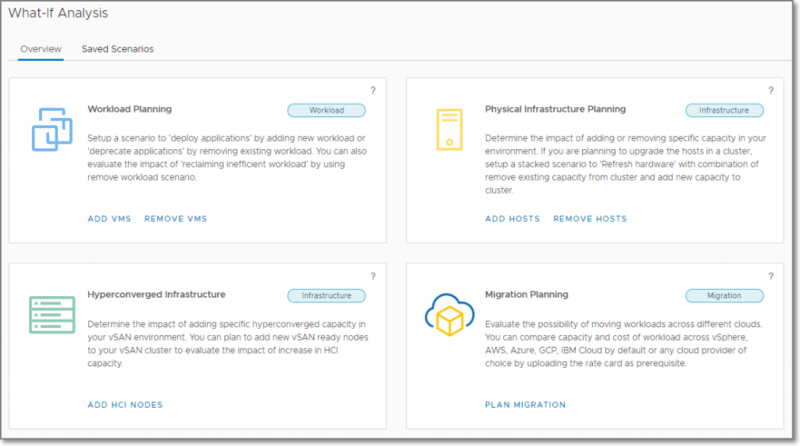 A common question is whether vRealize Operations can manage workloads in VMware Cloud on AWS, and the answer is a resounding YES! To vRealize Operations, VMC on AWS looks like just another VMware vCenter instance. It can also run ON VMC on AWS. The biggest themes for this release are powerful HCI operations, apps-to-infrastructure observability, rich and precise planning, and integrated compliance. We’re excited about the shape that Self-Driving Operations is taking and hope you are too! sales team member today, download a free trial, or take advantage of a number of limited promotions to get started with vRealize Operations. The Total Economic Impact™ Of VMware vRealize Operations, a March 2019 commissioned study conducted by Forrester Consulting on behalf of VMware. The Total Economic Impact™ Of vRealize Intelligent Operations, a November 2016 commissioned study conducted by Forrester Consulting on behalf of VMware. Burt, Jeffrey. “Dell EMC Bolsters Converged Infrastructure With VMware Integration.” EWEEK, 29 Mar. 2019, www.eweek.com/storage/dell-emc-bolsters-converged-infrastructure-with-vmware-integration.